If you ever needed any evidence that the FA Cup can be special for non-league clubs, just ask any supporter of a team that has experienced success and the trimmings that go with it. One FA Cup tie can do more for a non-league club than a 1,000 Isthmian or Southern League games. The majority of a small town’s population doesn’t really care if the local team are playing another team from another small town. But mention that Acacia Avenue Wednesdays are playing Chesterfield or Bolton Wanderers in the FA Cup, and it’s a different story. In days of old, the uninformed would comment: “But they’re on the pools coupon, aren’t they?”, followed by, “I might take a trip down there to see that game.” As soon as the casual onlooker can identify with your opponent – and realize that the team from across the common actually plays in the FA Cup every year – you’re in business. For Hitchin Town in 1994-95, it was Hereford United. Hardly a box-office draw today, but 20 years ago they were in the fourth tier of the English game and just about hanging on to that status. Hitchin’s league season had been dire. They had barely won a game and had lost key players like Rob Johnson, Steve Conroy and Peter Gleasure. In the FA Cup, it was a different matter. Each round had its own tale to tell: comeback at Newmarket; Houdini escapology against Tiptree; likewise against Cambridge City; and rearguard action at Burton. When Hitchin won 1-0 at Burton’s Eaton Park, they reached the first round for the first time since 1978. Those who witnessed this FA Cup run will recall the journey home from Burton and the stop-off at Crick in Northamptonshire. There was an ecstatic celebration party, orchestrated by the late Alan Sexton and current President Tony Huckle, where beer flowed, whisky glasses clinked and a veritable feast was devoured. 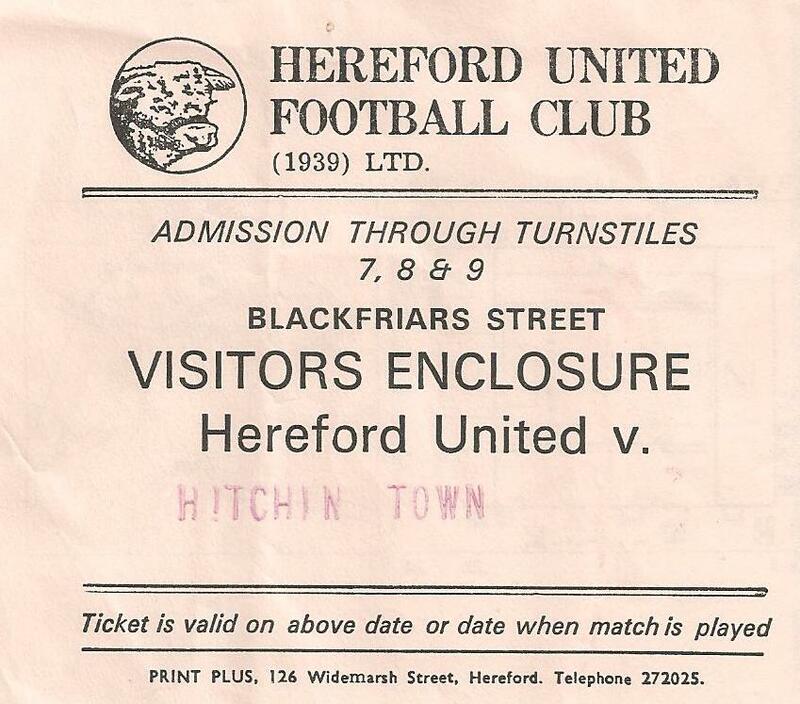 When the draw was made for round one 24 hours later, it paired Hitchin with Hereford United. Some were disappointed, but this was an opponent with FA Cup heritage – 1972 and all that. Nobody gave Hitchin much chance at Edgar Street, but the club was determined to enjoy its moment in the spotlight. The pre-match arrangements, again put together by then club secretary Alan Sexton, included lunch in Ross-on-Wye at Pengethley Manor. Nerves were starting to build and when we arrived at the hotel, guests viewed the track-suited team and club officials with no small measure of curiosity. When Football Focus mentioned the tie at Hereford, muted cheers could be heard. Tweedy residents , looked up from their newspapers, smiled and decided it was time to move on! As the team coach neared Edgar Street, everyone fell quiet. Manager Andy Melvin and his number two, that “rock and roll footballer” Robin Wainwright, were normally ebullient at the front of the coach, but even they seemed to be in awe as the floodlights came in view. Hereford were welcoming. Their chairman, Peter Hill, who looked more like a racing correspondent for the Times than a football man – all felt hat and camel coat – explained that even a small club like Hereford came under pressure from fans to succeed. He revealed that this had extended to his horses being attacked at some stage by unhappy supporters. As for Hitchin’s fans, they were in clover. A large gathering behind the less-than-steep terracing was in fine voice, while up in the stand, a flare went off just before kick-off. Alan Sexton, never comfortable sitting among the politburo, opted to join the terrace folk. He left the stand, walked around the permimeter and climbed into the terrace area with the Hitchin crowd chanting, “There’s only one Alan Sexton”. He enjoyed that. We enjoyed that. The game got underway and Hitchin shocked the home team. Two outstanding Shaun Marshall goals gave the Canaries a 2-0 lead. We could barely control our emotions in the stand, especially as our hosts were sitting all around us. At half-time, it was difficult not to get over-excited as Hill and his colleagues refreshed us with coffee and cake. We began to speculate who we might be drawn against in round two. Hereford had other ideas, and came back to level 2-2. One goal was slightly dubious, Jon Bone getting pushed into Gerry Sylvester, but by the end of the game, Hitchin were hanging on. Never mind, there was the prospect of a replay. But the logistics were very taxing. And waiting for Hitchin were Wycombe Wanderers or Gillingham. I recall the days leading up to the replay with a wince or two. As press officer I was suddenly deluged with enquiries from the media. Furthermore, I was – for some strange reason – asked to put my signature on the safety certificate for the ground, the limit for which had been set at 3,100. With TV cameras present and national journalists in attendance, the big game atmosphere was something to be savoured. But it also highlighted the challenges a small non-league club faced when it came to a game of such high profile. For a start, segregation was an issue. But, not for the first time, the club’s behind-the-scenes heroes, people like John Moon and Richard Bunyan, came to the fore. The “segregation” was indeed improvisational, a truckload of builders’ fencing perched, somewhat precariously, on the Ickleford end of the ground. Stewarding was another requirement and the local refereeing association was dragooned into action. As for the game, it was all a blur. 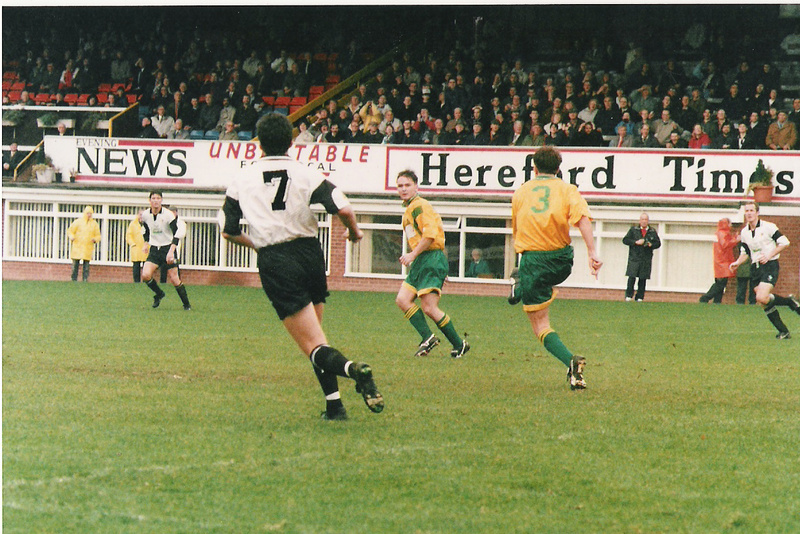 Hereford took the lead twice, but each time, Hitchin responded, through Jon Bone and then Gary Williams. Irishman Micky Wilson, whose career with the club was very brief, gave Hitchin a 3-2 lead, prompting enquiries from the press as to his background and career. Of course, they were dying to know that Wilson built roads and his tar-encrusted van sat in the Top Field car park. Whatever happened to Micky Wilson became a regular tap-room discussion at the club in the years that followed. They’re still trying to find out! The game was decided in the final seconds. Hitchin broke and Marshall raced clear of the defence and rifled in a low shot. Smoke filled the pitch and to borrow from Kenneth Wolstenholme, “there were people on the pitch…they thought it was all over”. The goal made it 4-2 and the crowd streamed on, but the final whistle had not been blown. Referee Graham Poll took the teams off. Confusion reigned. I was sent into the dressing room to find out what was happening. “Graham, is the game over,” I asked the referee, sweat dripping down his face as he sat swigging a drink. “I blew the whistle, didn’t I?”. This was the catalyst for joyous mayhem on the pitch. Supporters – most of whom had never been seen at Top Field before or since – walked across the pitch. TV and radio were seeking the thoughts of Andy “I’m a lucky man” Melvin and in the days that followed, he became something of a minor celebrity. And we did. Actually, it doesn’t get much better if you follow a non-league club. Wycombe Wanderers soon punctured that balloon, however, winning 5-0 at Top Field in round two. Hitchin had their moment, though, and a year later it would happen all over again. I tendered my resignation after the Hereford replay, eventually leaving at the end of the 1994-95 season to pursue freelance opportunities. But that’s a different story for another time.